Died: 16th September 1916; age 32: KiA. 1891 5, St. James Court, Fore Hamlet, Ipswich. John was 5 years old and living with his parents & brother. Samuel Percy, 43, a Labourer, born Badwell Ash, Suffolk. Mary Ann Percy (Warren), 41, born Badwell Ash. James Percy, 8, born Nettlestead, Suffolk. 1901 4, Abbott’s Court, Stoke Street, Ipswich. John was 15 years old and living with his parents, sibling & nephew. Samuel, 53, a Marine Store Dealer – own account. James, 18, a Labourer – Oil Mill. Alice Haddock (nee Percy), 36, born Ike, Suffolk. Herbert Charles B. Haddock, 2, born Ipswich. 1911 No. 4, Daniel’s Court, Union Street, Ipswich. John was 26, years old, a Luggage Porter – own account. He was living with his brother & sister-in-law. James, 29, a General Labourer. Ellen Elizabeth Percy (nee Page), 29, born Forset Gate, London. 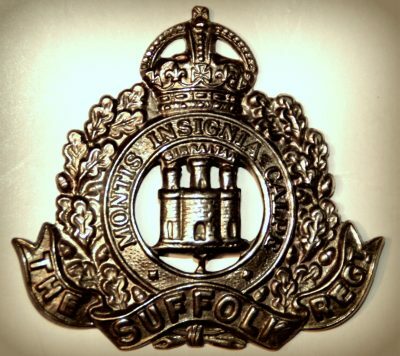 John’s mother, Mary Ann Percy died 1914, Ipswich. Soldiers’ Effects to Samuel Percy – father.